Spring beauty is one of the earliest spring wildflowers. They have just popped up in the woods. Tiny delicate pink & white flowers, striped with darker pink cover a small hillside near the creek. These tiny Tete A tete daffodils are up too. And the ranch dogs are enjoying the sun. Several weeks ago I visited a nearby park for their maple syrup demo. I ordered some supplies and tapped 3 of my trees. Although I had missed the first two weeks of the season, the sap would be running 2 to 4 more weeks, depending on the weather. Within 3 days, I had 3 gallons of sap. The turkey fryer was fired up and the boiling began. I didn't have lots of sap, so I used a chain to suspend the thermometer in the liquid. Here, I've switched to a smaller pan and the water evaporates from the sap. Four hours later, I have 9 oz. of pure maple syrup. The first wildflowers appeared today, the Harbinger of Spring. They are tiny and easy to miss. They are barely an inch tall. This one has a dime at its base. The woods are pretty drab right now. The creek is muddy and snow is still patchy. The only green in the woods is moss on logs. 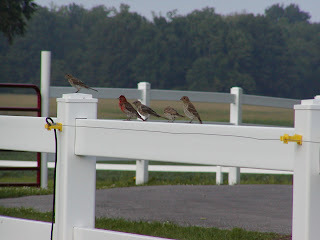 But the robins are back! Spring can't be far behind. Its maple sugar time in Indiana. 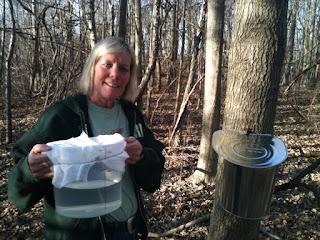 The nights are still below freezing, but the days warm up into the 40s & 50's causing the sap to run. Trees must be 10" in diameter to tap. This one is quite large and can handle 2 taps. Trees are tapped with a spile and the sap collected in a bucket. It takes 40 gallons of sap to make a gallon of syrup. Here, the sap is boiled until the right consistency, usually 6-8 hours.